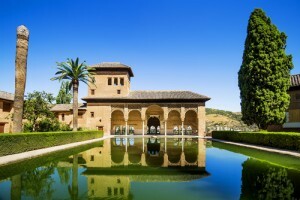 Why you must visit the Alhambra palace, Granada. The Alhambra is an ancient palace-fortress built by the Arabs in the middle of the fourteenth century which sits on a hilltop overlooking the Andalucian city of Granada with the Sierra Nevada mountains in the background. You can see the beautiful Alhambra palace from miles around. It is one of the best kept palaces of its era and became a UNESCO World Heritage Site in 1984. Its name translates from Arabic as “The Red Fortress” due to the colour of its walls. The building features intricate designs of the Moorish style such as delicately detailed mosaics and carved cedar-wood. Not surprisingly the historic and romantic ambience has made it popular amongst poets, writers and artists with Washington Irving publishing “Tales of the Alhambra” in 1832. Although of Arabic origin, it has evolved over the years due to influences of other cultures; the palace of Carlos V and the church of Santa María. * The peaceful Generalife Gardens – featuring the Patio de la Acequia, a long pool with fountains, trees, flowers and archways. If you are lucky your visit may coincide with one of the outdoor concerts that often take place in the gardens. * Views from the Torre de la Vela. To get the most out your visit to the Alhambra it is recommended that you set aside a whole day and arrive early. In the summer season it is open 08:30-20:00 and in the winter, 08:30-18:00. It is highly recommended to buy your tickets in advance to avoid the lengthy queues on the day. In the peak summer season the Alhambra received over 7000 visitors per day, so visitors who have not pre-booked tickets may be turned away. You can also book a guided tour to find out as much as possible about the Alhambra. So if you are in search of architecture, history, art or botany, the Alhambra has it all. For up-to-date information, check out the official Alhambra website.